CARACAS, WILLEMSTAD - The Venezuelan State Oil Company PdVSA guarantees delivery of crude oil via Petrocaribe. 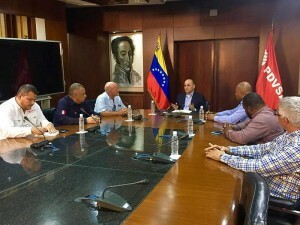 The message comes from the Venezuelan minister of energy, also director of PdVSA, who received a trade union delegation from Curaçao. According to a court ruling, PdVSA has to deliver oil to Curaçao and Bonaire. If the Venezuelan company does not comply they will have to pay a penalty of 1 million guilders per day.